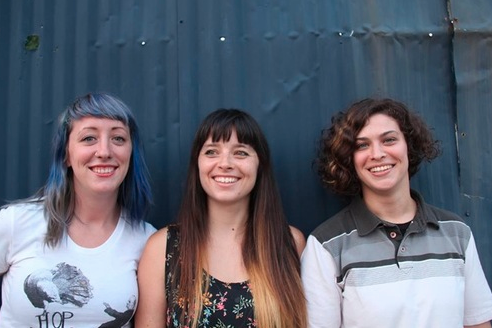 Cayetana performs Friday, May 5 at First Unitarian Church. Marsha Ambrosius is a quiet legend in the fabric if Philly’s soul scene. The London singer came up in the early aughts alongside Natalie Stewart as half of the duo Floetry. In the decade since Ambrosius went solo, she’s been a consistent ride-along singer for many of hip-hop’s biggest stars, most notably Dr. Dre, who enlisted Marsha for a bevy of songs on his recent and long-awaited swan song. Co-headlining this week’s show at the Keswick is Eric Benet, a smooth soul singer from Atlanta who released his seventh album last year. The local indie trio Cayetana usually trades in pop punk, but their new album has a heavier side that reflects its subject matter. It’s a record explicitly “about mental health” the group recently told Uproxx. “Struggling with that and settling into a new kind of normal where you can finally recognize your own your destructive behaviors and accept love in your life.” This weekend Cayetana celebrates the release of “New Kind Of Normal” — their second full-length and first on their own label — at The First Unitarian Church with a bill full of (mostly) fellow Philadelphians. Ab-Soul, the vaguely spiritual rapper from the flourishing California label TDE, has been unspooling convincing conspiracies for almost a decade. Soul comes off like the weirdo in a crowd full of West Coast gangster emcees, but he’s carved out a niche that fits only him. The Carson, California rapper’s last outing was “Do What Thou Wilt,” in which he upped the ante with more out-there musings than ever before. Ryan Adams is prolific first and foremost, but even when his music sounds like a retread, the North Carolina singer-songwriter channels a practiced vitality. He pours out his personal life over and over for fans to pore over. So a live Ryan Adams show presents a familiar quandary: what songs will he play? Certainly, he’ll be playing his latest—a breakup record called “Prisoner” — but he’ll no doubt tick off his career milestones as well. Beanie Sigel is the rare rapper who seems both slept on and legendary at once. The emcee epitomizes the national love affair with Philly hip-hop that Jay Z facilitated almost 20 years back, spearheading a group of rappers that included Freeway, Peedi Crakk, the Young Gunz, and more. All these years later, as a bona fide hip-hop veteran, Beanie Sigel’s name rings out in headlines more than for his music. But a string of legal trouble (and a slightly mysterious shooting that collapsed one of his lungs) hasn’t kept Sigel out of the booth from which he’s been slowly mounting a comeback. An incident at the Trocadero last year involving comedian Katt Williams had him swearing off returning to ever play in his hometown again. He's apparently changed his tune on that. Aaron Abernathy is the leader of The Nat Turner Band, a D.C. soul and funk outfit that backs the Detroit rapper Black Milk. Abernathy, a Cleveland native, has just released his first solo album in the form of “Monologue.” Over 11 tracks, the multi-instrumentalist makes a strong case that he’s a star in his own right, channeling his nasally voice in weird and funky ways. On Sunday, he’ll be joined by his band and a yet-to-be-announced special guest. The U.K. band The Damned were some of the very first to peddle punk music on record. Four decades after they broke ground, the outfit has released 10 albums in a myriad of lineups. But the group’s original sentiment has never wavered, and they’re now celebrating 40 years with an extensive tour run that stops by the TLA on Sunday.